Another important aspect of Buy Here Pay Here is Customer contact. To help keep track of Customer promises and followup, you can use the Call Log. To access this click on the Call Log button located on the main screen or click the Call Log tab. Once the Customer is selected, click on the "Add Comment" button to add a comment, and a reminder date. When complete, click on "Update Comment". Select the comment you want to edit out of the list as shown above. Click on the "Edit Comment" button to edit the comment and/or the reminder date. When complete, click on "Update Comment". Select the comment you want to delete out of the list as shown above. Click on the "Delete Entry" button. You will be prompted to confirm the deletion. If you choose Yes, the entry will be deleted. 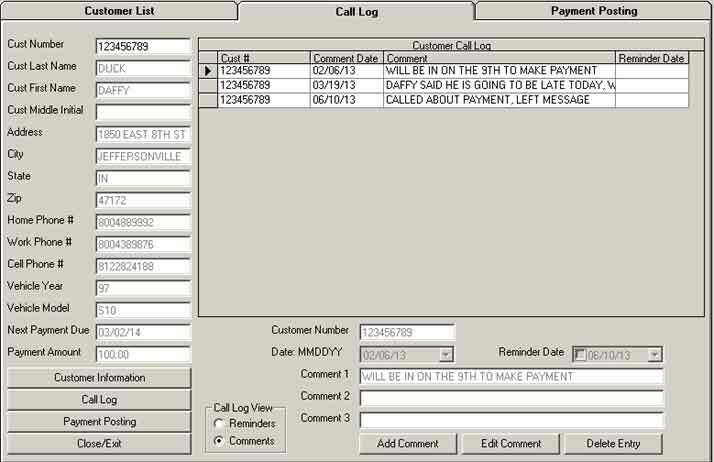 The call log view allows you to separate the entries shown in your Customer Call Log Grid to display only Reminder comments, or Customer comments. When you select either option your grid will resort with the appropriate information. If you would like to schedule a reminder date on a comment, click on the Reminder Date field and select the date out of the calendar. Once you click on Update, and finish your entry, your Reminder Date will be set.